Last week we shared information regarding the green light from the county commissioner meeting to proceed with construction at the World Equestrian Center (WEC) at Golden Ocala. This week we’ve received the following updated press release which contains further details on the equestrian center, the residential community and the lifestyle component of the WEC. The focus on residential lifestyle and recreation, in addition to the state of the art equestrian amenities, will undoubtedly enhance our already robust region! 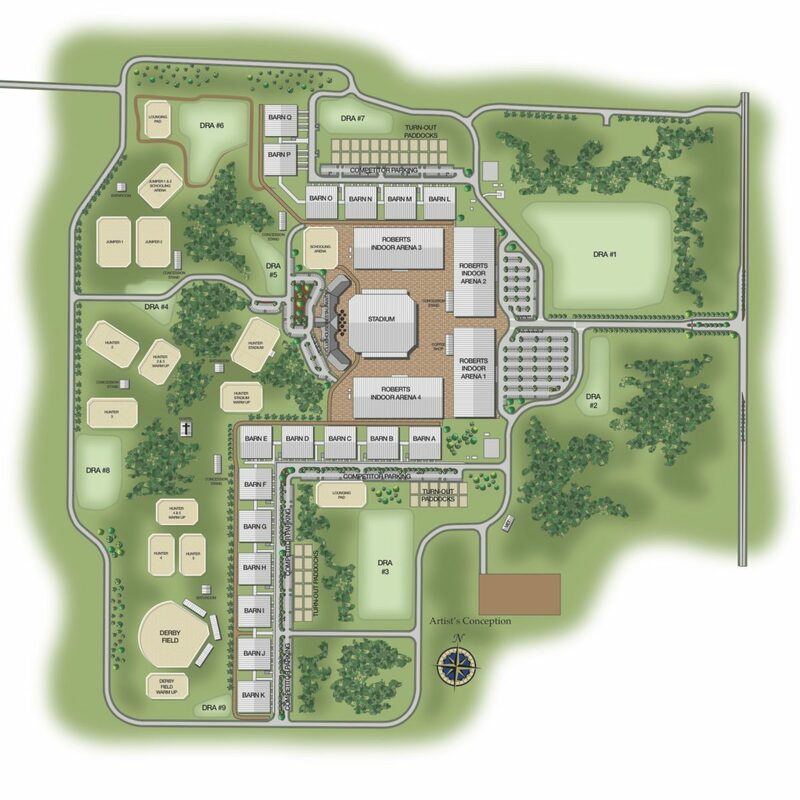 The WEC Site Plan includes the architectural rendering of the equestrian competition venue, inclusive of the Grand Outdoor Stadium, 17 Outdoor Arenas, 4 large indoor arenas, stabling, turnout and the trail system. In addition, the following press release reveals plans for a variety of residential, hotel, retail and restaurant options which will make the WEC at Golden Ocala a sought after lifestyle destination, resort and year round community! OCALA, FLorida – October 30, 2017 – The World Equestrian Center and Golden Ocala Golf & Equestrian Club received unanimous approval from Marion County Commission for land-use changes in addition to ongoing construction of the exclusive World Equestrian Center, making this impressive project over 3,000-acres. Approval for Equestrian Estates, a residential community which will feature 300 farm estates on multi-acre lots is slated to set the standard for the equine industry. With an outstanding equestrian facility already operating in Wilmington Ohio, The World Equestrian Center in Ocala Florida is poised to be an ultra-luxury and unique lifestyle destination. Luxurious Hotel with stylishly appointed rooms and suites with 18,000 sq. ft. of retail space attached. 12,000 sq. ft., fine dining restaurant with a seating capacity of 500+ along with specialty pastry boutique by on-site chefs, with views overlooking the Grand Stadium. 4 additional on-site dining options. 200 spacious RV sites with full hookup and pet friendly environment. The future development of Equestrian Estates will enjoy the same luxury and convenience as the residents of Golden Ocala Golf and Equestrian Club such as security to assure peace and tranquility, golf cart access throughout the community, an on-site veterinary practice for large and small animals and laundry/dry cleaning services. Residential opportunities including condominiums are currently available in the already established community of Golden Ocala Golf and Equestrian Club.